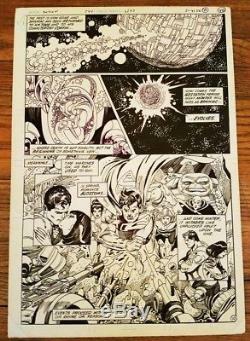 This is a page of original art by Gil Kane from the historic 45th anniversary issue of Action comics (#544). And contributed to the 1988. Character, a nemesis of Superman, was revised by Kane and Marv Wolfman in. The art page measures 11x16. " The image area measures 9 3/4 " 14 3/4. The artboard has been mounted to white foam board. The item "Gil Kane original art Action Comics #544 pg 10" is in sale since Sunday, March 04, 2018. This item is in the category "Collectibles\Comics\Original Comic Art\Interior Pages". The seller is "randah_ztognibd3" and is located in Minneapolis, Minnesota. This item can be shipped to United States.